DUBLIN CITY COUNCIL will next month begin a six-week trial of pedestrianising Suffolk Street in Dublin city. The council confirmed that the trial would begin on this Saturday 2 February and last for six weeks. Suffolk Street is located in Dublin’s south inner city at the bottom of Grafton Street and is a popular thoroughfare containing shops, restaurants and bars. 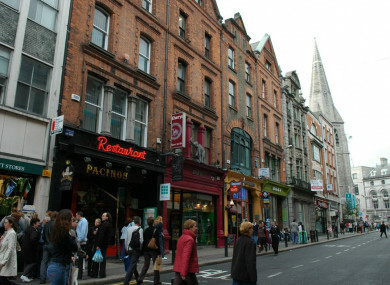 The street used to be one of the main arteries connecting buses coming from Nassau Street and the south side of the city with Dame Street. This route was closed off to buses and traffic about three years ago to facilitate works on the Luas Cross City. The route has not been reopened to traffic since. Plans for the pedestrianisation of the street have been mooted by DCC for years, as part of a wider initiative aimed at cutting the number of private cars coming into the city. Last year, An Bord Pleanála rejected plans by DCC for a public plaza at College Green which would have banned all motor traffic from entering Dame Street via College Green. College Green is just a short walk away from Suffolk Street. A spokesperson for the council said that the area from the boundary of 5/6 Suffolk Street to Grafton Street will become a pedestrian zone, with the same access hours as Grafton Street. “This will see the current bollards and planters moved from the bottom of Suffolk Street to this new location,” the spokesperson said. Commenting on the plans for Suffolk Street, Graeme McQueen, spokesperson for Dublin Chamber – a representative group for businesses in the capital – welcomed the initiative. “From our point of view we see the trial as a good thing – it gives people a chance to adapt,” he said. We’ll be watching the trial closely and consulting with our members. He said that the trial would “get everyone’s heads around what pedestrianisation of Suffolk Street would involve and mean for the city”. McQueen said that Suffolk Street had been in “a sort of limbo” since its partial closure to traffic to facilitate Luas works. He said that there was strong support among the public for more pedestrianised walkways and family friendly areas in the city, but that businesses wanted to make sure that any changes were implemented in “a considered and educated way”. The DCC spokesperson said that the arrangement will be reviewed after the six-week trial “when a decision will be made as to whether these changes should be made permanent”. “Any comments or observations during the six-week trial period should be directed to citycentreprojects@dublincity.ie,” they said. Email “Dublin's Suffolk Street to be pedestrianised for six weeks starting Saturday”. Feedback on “Dublin's Suffolk Street to be pedestrianised for six weeks starting Saturday”.